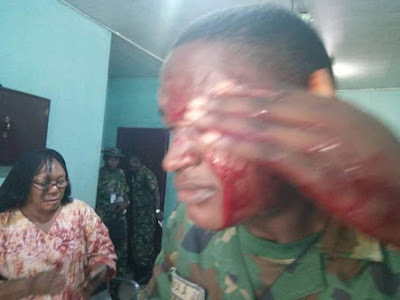 The Nigerian Air force base in Port-Harcourt, Rivers state, was yesterday in a state of confusion when Mrs Irobuisi, wife of Air Commodore C.C. Irobuisi who is presently the deputy director of safety, Defence headquarters Abuja, attempted to murder one of the soldiers in Air force secondary school in the city. It is alleged that Mrs Irobuisi has assaulted airmen and officers severally at different locations. She was suspended from Nigerian Air force Officers Wife Association few years back for slapping and biting another officer's wife.